Strictly for fans of the immensely popular TV series, this third hardcover spinoff novel from Stoker Award-winner Holder (Dead in the Water and numerous mass market Buffy books) remains faithful to formula. Here the four teenage heroines and dedicated ""Slayers"" indulge in ""girl-talk"" about mall-shopping, clothing, cosmetics, high school and boys when they aren't fighting vampires, trolls, demons and even an attractive ancient female villain, whom they attack with kung fu kicks, uppercuts, right crosses and straight faces at all times. Willow, Buffy's best friend, gets killed in an auto accident, but since she's vital to the show, it's no surprise when Willow returns. Buffy's ""cured"" vampire boyfriend, Angel, adds some male interest. The book has some, albeit negligibly little, humor, primarily implicit in the irony of a small, mythically American town, Sunnydale, Calif., being overrun by a throng of scenery-wrecking monsters. 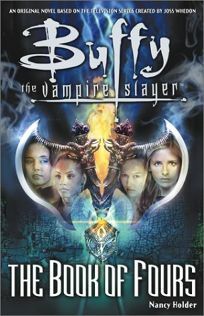 Too often this detracts from the eponymous star, as Buffy and her Slayers engage in endless, brainless action. The book should carry a warning label that it is unsuitable for anyone older than 16 to read unless accompanied by a child. Still, it is nice to know the world is safe from Evil. (Apr. 3) Forecast: The release of this tie-in novel is particularly timely, as a bidding war (and attendant media coverage) is brewing over the rights to this hit series, which Warner Brothers may or may not renew.